There are 30 different hub models here, the idea is to be able to offer a DCR hub for any occasion. We apply stickers to our plain hubs and there are generally images of such hubs built up into wheels on our instagram feed. DCR Components set a new benchmark in wheel performance. They have been developed to meet the demands of serious riders in the UK whilst offering exceptional value for money. The components themselves come directly from factories/workshops from a range of manufacturers. Where necessary, they have been modified to meet the demands of UK riding conditions. I have not given the full details of all the modifications here. All components have a 2 year warranty. All of the wheels themselves are built in the UK by DCR wheels to the standards my customers have come to expect. The builds have a lifetime warranty. Each wheel is built to within 0.1mm, on one of our P and K Lie truing stand, tensions are measured with either a calibrated Sapim Tension meter or a Sapim calibrated DT Swiss tension meter. Each wheel is thoroughly stressed and rested to ensure it is ‘settled’ before dispatch. It is important appreciate the value of a good build; it adds a good deal of reliability and performance to the setup and can only be achieved with precise tooling. You can mix and match DCR components with other manufacturers if you wish to obtain different and at times higher performing or more economical combinations. Weight is a highly subjective thing. I sell front hubs that still take J bend spokes that can be as light as 33g. So you may say that this hub is heavy. However it is still more than 15% lighter than a Chris King R45, DT Swiss 240 or a Royce Ultra Light. It is also lighter than a White Industries T11 and only a little heavier than a Tune Mig70. For me the most important element why it is heavier than a NovaTec A291-SL – 25g heavier to be precise and yet the price point is similar. It is because it has a wider bracing angle (much wider) heavier axle interface and heavier bearings. The reasons for all of these are in pursuit of strength, stiffness, riding comfort and durability. The carrying capacity of the bearings in the DCR hub is more than double that of the NovaTec. The bracing angle is over 25% bigger which means that the wheels it builds into are both stiffer and more comfortable. The axle interface is a screw fit, rather than a push fit which, while being heavier is stiffer, particularly as the bearing loading is closer to the dropout which also places less strain on the axle. You do have to be careful when lacing with this hub because sometimes if laced tangentially it can foul your fork – it depends on the fork design. 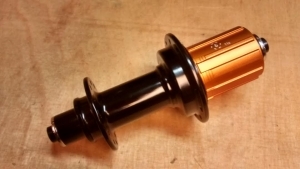 Radial lacing is allowed on these hubs and should be used to allow a fit on certain forks. For radial lacing 100kgf will be applied, for tangential it will be 110kgf. Two 6900 bearings are used here, made by TPI and are ABEC 5. While I would love to report a massive bracing angle on the drive side, it simply is not possible on any 130mm spaced 11s compatible road hub. Cassettes are just too big. The bracing angle on this determined by flange spacing is similar to what you will find in a White Industries, Tune, Chris King, Royce and NovaTec hub. Due to the problems you get with this bracing, it is important that rims which can tolerate at least 120kgf are used. The weight is very competitive on these rears – lighter than White Industries, Chris King, Royce, DT Swiss 240 and NovaTec. My key emphasis with these hubs has been durability and sealing against the elements. The quality of the seals is very good on them and they have ABEC 5 TPI bearings again 2×6902 and 2x 6802. The bearings are larger than you will find in the NovaTec F482-SL. As with the front, they have been weather treated, the ratchets also have a special treatment applied to keep the mechanism quiet and durable. There are 6 pawls inside the hub which engage in two groups for 48 points of engagement. The pawls and ratchet are steel. The external sealing on the hubs is soft to help guard against water intrusion but this does add a small amount of drag (comparable to a lot of hubs and less than Royce for example but more than some low friction hubs like White Industries). The axles are 15mm which helps to keep builds stiff, so do the textured end caps. All hubs come with a spacer for running 8/9/10 speed cassettes. The axles and freehub body are made from 7075 aluminium. A cassette with an alloy carrier is strongly recommended. The shells are 6061 aluminium. For £140, you can buy a heavily machined titanium freehub body or £120 upgrade, however I recommend starting with the alloy. If you torque your lockring to 40nm, I would be surprised if you suffer with ‘bite’. The DCR ‘UK weather treatment’ is a key area where DCR hubs are set apart from others, they last longer and work better because of it. However, when it comes to a race day hubset, it is quite possible that what you want is not a weather treatment, you want a speed treatment. Elements of the weather treatment will remain to improve the durability and reliability of the hubs, however as an additional element a very special W&S HS grease prep is used – this is such an exclusive product, I am not allowed to sell it, it is restricted to a limited number of outlets and it is used in team sponsorship in a number of fields. The speed treatment in combination with the small bearings and light weight make this hubset a great choice for those looking for marginal gains at much more affordable prices. The idea with the lightweight road hubs was to provide a solution for those looking for a very light set of wheels at a more affordable price. This will suit lightweight riders well in particular and the strength, stiffness and durability on the hubs is still very reasonable. However these hubs are better suited to lighter riders, lower mileage and fairer weather, mainly owing to their smaller bearing size. I generally think of them as more of an event hub rather than an everyday hub. This is smaller bearings than the standard rear, a lot has been done to trim weight off of this hubset, so the weight for this rear is now only 193g! However, it does still build into a stiff wheelset, the hub has 48 points of engagement provided from 6 pawls. The high performance bearings are still weather treated and in conjunction with the front, exceptionally light sets of wheels are possible for remarkable prices. For example, a Ryde Pulse Sprint build with these in a 24:28 drilling would produce a wheelset weight of 1290g with CX-Ray spokes and prices would start at a humble £465. Lightweight carbon options would be as low as 1250g and start at £675. All still with a 2 year warranty. Photos to follow on these. The idea behind the hub was to provide a bigger rider weight limit. So it is 100kg on the standard road and around 120kg on these. The fronts are convertible between various through axle interfaces but are still rim brake hubs. That also gives them larger bearings and are available in 28 and 32h. The hubs have bigger flanges than the standard road hubs which also makes it easier to have more spokes. The engagement is the same 6 pawl design as before, however the freehub body is made from stainless steel rather than aluminium for increased strength, resistance to bite and improved durability. This is the same front hub as the Clydesdale but the rear hub has a wider spacing and has been engineered for even greater strength, designed to withstand the abuse that laden touring provides. So if you are looking for a fully servicable, exceptionally reliable and highly durable pair of tough hubs to take on an adventure – this is a fantastic option. You can also pair the rear with a dynamo hub to give yourself a 3w power output for devices or lighting. The DCR centre lock is one of our most popular hubs owing to is huge versatility. The front can easily be converted between quick release, 12mm and 15mm through axles. The rear can be 135mm qr or 135 x 10, 135 x 12 or 142 x 12mm through axles. 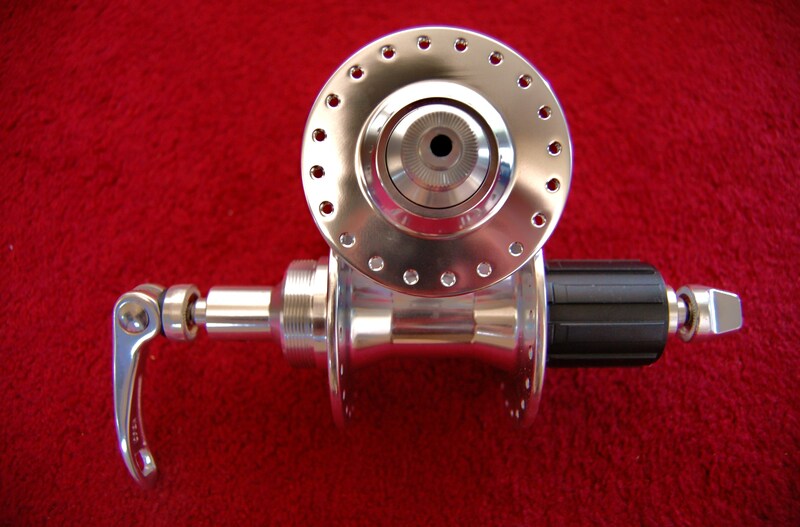 The freehub can be Shimano, Campagnolo or XD compatible. 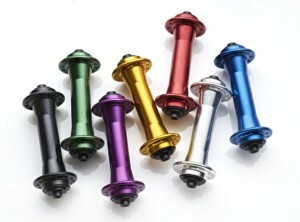 The hubs come in a broad variety of colours with additional colours from Feb 2016 (gold, purple and green). If you run a converter, you can also fit any 6 bolt rotor on these hubs. However, people often prefer to install 6 bolt rotors on 6 bolt hubs – for that you are better off using our standard disc. The weights of the hubs vary a bit depending on the combination. For example, the 15mm end cap weighs less than the QR cap. The 135mm x 12mm through axle is also the lightest for the rear. Weights for the hubset start at 370g. These are a standard disc hub, they can be used for a broad range of applications and have larger flanges allowing for different drillings. They weigh 170g front, 290g rear. Certainly these are no heavyweights but they are designed to be bigger, tougher hubs than the dedicated road disc versions. Their freehub bodies are 11s road compatible so they can be run with 11s road cassettes. They come with a spacer for running MTB cassettes or 8/9/10s road cassette. They have the same 6 pawl engagement system as the other hubs only are on a 56pt engagement rather than 48pt. The front hub is convertible between quick release, 12mm, 15mm and 20mm through axles interfaces. There is also a new convertible front hub which cannot be run in 9mm or 20mm through axles and has a smaller bearing but is only 120g. Most people consider the Hope Pro 4 a benchmark when it comes to a disc hub. Personally I would say that our own disc hubset sets the benchmark for me, being both lighter and cheaper than the Pro 4. Our hubs also despite rigorous testing have provided no issues when it comes to toughness or durability and are easily serviced. I have no concerns with the quality of Hope hubs. The only criticism I have for them is that during freewheeling they are really loud. DCR hubs in contrast are nice and quiet due to a different pawl and spring arrangement and a different engagement system. The front axle arrangement allows for easy conversion between qr, 9mm, 12mm, 15mm and 20mm through axles. The rear axle bolts together rather than pushing together making it a lot stiffer than some other hubs on the market, they can also be run in QR, 135x12mm, 135x10mm and 142x12mm through axle. 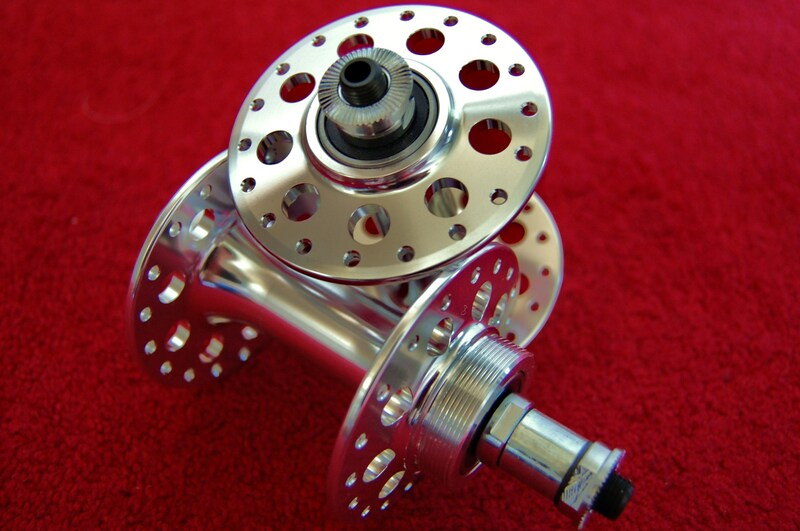 They can be run with a steel, alloy anti-bite freehub or an XD freehub. The hubs themselves also have softer seals and a dedicated UK weather treatment for extra bearing durability. They also claim overall victory when it comes to price, making them a great choice for a broad range of applications. DCR Ultra Light, 6 bolt hubset. £140/pair. The ultra light hubset features a convertible rear, but a dedicated quick release front. Unlike the rest of our range here they are straight pull. They are entirely in pursuit of saving weight on disc wheelset and only come in 24h. 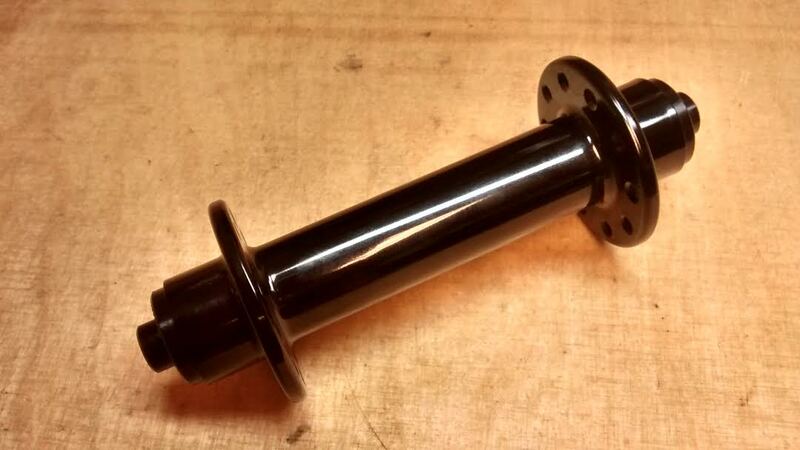 We offer these hubs with four rim options with CX-Ray spokes only. They come in at an impressive 330g/pair. The heavy duty disc hubset is a beefed up version of the standard disc hubset. It has additional bearings for 50% more bearing carrying capacity at the front and 100% more capacity at the front and it has a steel freehub at the rear. It is a seriously tough and re-assuringly heavy hubset, suitable for heavy duty touring or heavy duty off road applications. The hubs are convertible. Two options here, either disc brake or rim brake with threading at the back for an Arai drum brake or similar. They have a steel freehub body, large shells and large bearings and have proven themselves to be a reliable hubset for a broad variety of tandem applications. Popular combinations with these hubs would be either a Velocity or Ryde rim with Sapim Strong spokes with prices for that sort of set starting at around £240. ‘Kidneys’ of material have been removed from the hub shell to save weight. These have a solid spindle running through them with a nut on the axle. They are not a bolt on design.